Behind the 18th century home of merchant John Wister and his family exists a garden, a weather station, a bee house, and most recently, a hoop house. The hoop house, or high tunnel, was given to Grumblethorpe by Penn State as part of an effort to promote horticulture and healthy eating. Headed by Professor William Lamont of the Horticulture Department, the process took about three days to complete. 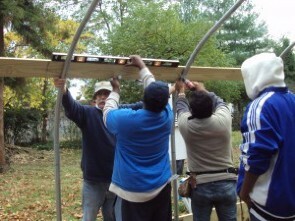 Grumblethorpe, which is located at 5267 Germantown Ave., is one of five sites to receive a hoop house in Philadelphia. The hoop house will allow Grumblethorpe to host its annual farm stand for a longer period of time. The house is one of many changes in the garden, which won a citywide contest in 2008 of best educational gardens in Philadelphia. The educational program currently incorporates three schools: John Wister Elementary School, DePaul Catholic School, and John B. Kelly Elementary School. Several classes participate by visiting Grumblethorpe two to three times a year. Grumblethorpe also plans to use its bee house to harvest honey in the future. The organization is also working with the Philadelphia Orchard Project to restore and replace damaged fruit trees. The longer harvest period allows for more fresh fruits and vegetables and can increase access to healthy food options for the community of Germantown. As defined by a report released by the Philadelphia Grow Project, food insecurity is “the lack of access, at all times, to nutritionally adequate foods for an active, healthy life due to financial hardship.” In the city of Philadelphia in 2000, 13.6 percent of households were food insecure. By efforts of Germantown’s Farm Stand, the neighborhood of Germantown has a local option for healthy food. This article was written and reported by Keisha Frazier for Philadelphia Neighborhoods, a publication of Temple University's Multimedia Urban Reporting Lab, and originally published on November 11, 2010. Wister and Butler Families Papers (Collection 1962), The Historical Society of Pennsylvania.